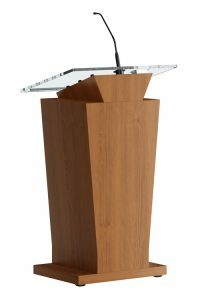 Wooden lectern with class in a curved shape. 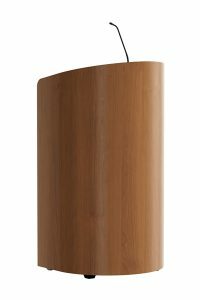 You have a wide range of finishes in wood (HPL) and colours to choose from. 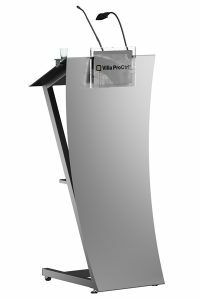 The wooden lectern Bend is optionally available with gooseneck microphone in shockmount, LED reading light, portable reading desk. For more possibilities see the options list. On the inside of this lectern there is storage space and a tray. The cabling of the microphone is hidden behind a wooden panel. 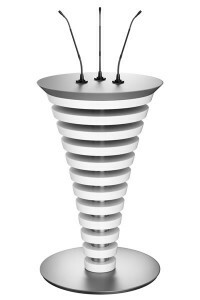 The microphone and reading light can be connected on the stainless steel patch panel at the bottom of the lectern.